SALEM, Ore. (AP) — U.S. Sen. Jeff Merkley of Oregon announced Tuesday he has decided after months of consideration not to enter the increasingly crowded race for the 2020 Democratic presidential nomination. Merkley said in an interview that he decided he would be more effective in championing issues by running for his third term in the Senate instead of being a presidential candidate. The large field of Democratic contenders for the White House was not a major factor in his decision, nor was an Oregon law that prevents him from being on the ballot for more than one elected office in any given year Merkley said. “I’ve never shied from a fight, and there’s nothing about the field that would make me reluctant to be there,” Merkley told The Associated Press in a telephone interview Monday night. Merkley amped up his presence on the national stage by vocally opposing the Trump administration’s immigration crackdown that has seen families separated and children put in detention facilities. But Priscilla Southwell, a University of Oregon political science professor, said that while Merkley has made a name for himself in Oregon and some other parts of the country, he is not well-known nationally, and the field of contenders is large. “I think it was a very wise choice,” Southwell said. Merkley said he aims to fight anti-democracy moves including voter suppression, gerrymandering and dark money. He said he also wants to focus on helping families by improving health care, education and access to living-wage jobs and on stemming climate change. “These are the things we feel like we have to take on, and we have to take them on boldly and aggressively,” Merkley said. He is not endorsing any candidate yet but said he is impressed by many of those Democrats who have already declared their candidacy or intention to run. “If you’re running, you’ve got to present a credible and determined vision on how you’ll take on these problems,” he advised the growing field. In just the past few days, former Colorado Gov. John Hickenlooper and current Washington Gov. Jay Inslee launched their presidential bids, and 2016 presidential nominee Hillary Clinton and former Attorney General Eric Holder said they’re not running. 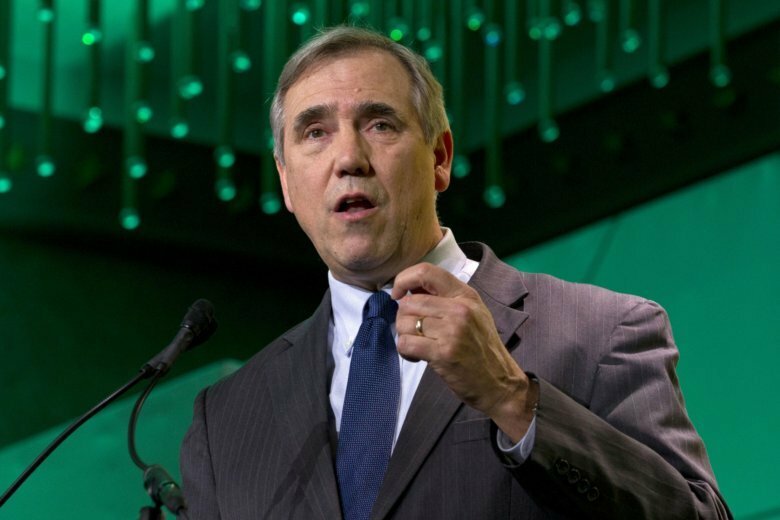 Merkley expressed guarded optimism that Democrats might regain control of the Senate in 2020, girded by opposition to President Donald Trump. If the House were to impeach Trump, the Senate would act as jury in a trial overseen by the chief justice of the Supreme Court, and Merkley would have a seat in the juror box, something he indicated he anticipates happening.